Donate or Sponsor a Dog! 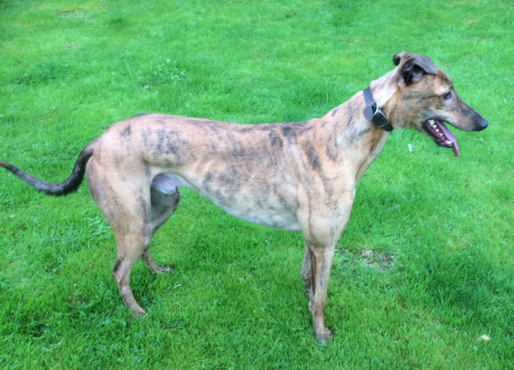 Meet Bob, a beautiful brindle boy who is 4 years old. 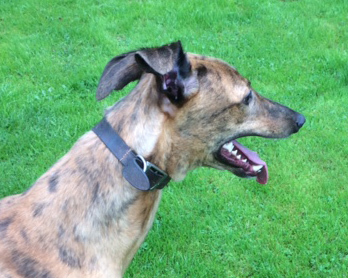 Bob has come back to us as he fell out with his adopters’ dog, (he has been checked by the vet and our dog behaviourist to ensure there are no background issues that caused this fight),consequently we are seeking to re-home him as an only dog, although he gets on well with our other greyhounds, he can get quite stressed if left along. He is a fairly big chap who is a little under weight at this time, but we are endeavouring to put weight on him by feeding him extra meals. He loves being with people and always greets you with a big smile and a wagging tail. In fact he has wagged it so much that he has damaged the tip and at the moment he is proudly displaying a bandaged to all his pals. If you are a UK Tax Payer we actively encourage you to “Gift Aid” your donation.